High Savery Dam and Reservoir is located on Savery Creek. Savery Creek is a tributary to the Little Snake River and is located in the Green River drainage. 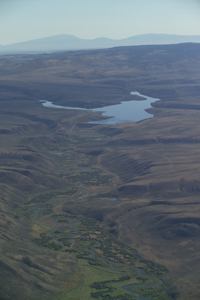 The drainage area of Savery Creek at the dam site is 107 square miles and comprises approximately 2.86 percent of the entire Little Snake River watershed area. The Savery Creek and the Little Snake River watersheds drain a sparsely settled area of south central Wyoming and Northwest Colorado. The communities of Savery, Dixon, and Baggs, Wyoming are located downstream from the reservoir. 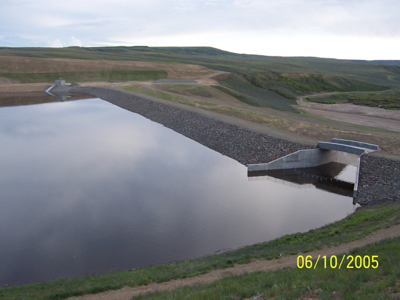 High Savery Dam and Reservoir is located approximately 20 miles north of Savery, Wyoming. In 1979, the legislature enacted WS 41-2-204, which defined the Stage I, II, and III Projects, as well as Little Snake River "in-basin needs". Stage I and II generally consisted of water collection, storage and transmission facilities to bring water from the headwaters of the Little Snake River drainage into the North Platte River drainage and to bring water from the headwaters of the Douglas Creek drainage into the Crow Creek drainage and from the North Platte River and Crow Creek drainages into the Cheyenne water system. Stage I was completed in 1966. In 1980, the legislature authorized the Stage II Project and, in the same legislation, instructed the Commission to study the feasibility of constructing storage in the Little Snake River drainage, above the Savery Creek confluence. This culminated in the construction of High Savery Dam from 2001-2004. The purpose of the project is to serve as an agricultural and municipal water supply, as well as recreation, environmental enhancement, and mitigation for the Stage I and II trans-basin diversion water supply projects.